I love babies. Everything about them. (Even the sometimes yucky stuff.) But this baby, is well, different. Have you seen "Reborn Babies"? They are vinyl dolls that have been "reborn" and made to look like real babies. When I saw one online once I couldn't stop looking because it really seemed real. "How strange. ", I thought. Yesterday, while walking through the toy show, we saw someone selling them. Actually, the guy at the booth was holding this baby, rocking it back and forth, and treating it as you would an actual infant. I couldn't resist...I had to hold it. The man gingerly handed it to me, and its head dropped back. Habit, or instinct, or whatever, kicked in and I quickly held its head up. But ITS A DOLL! So my question is this: How creepy is it that people want such a realistic (and in this case, somewhat purple) baby at their house? My friend (who took the picture) votes for extremely creepy. I'm inclined to agree with him. But, you know, all that creepiness seems to fade away when you consider this. Um...ewww. um the first thought I had when I saw this pic on flickr was super creepy..
i'm sorry...this is a tad bit on the scary side. right in time for halloween. hah :) the other baby is a bit worst, especially with the guys gnawing on it :(. your reactions are far too calm. 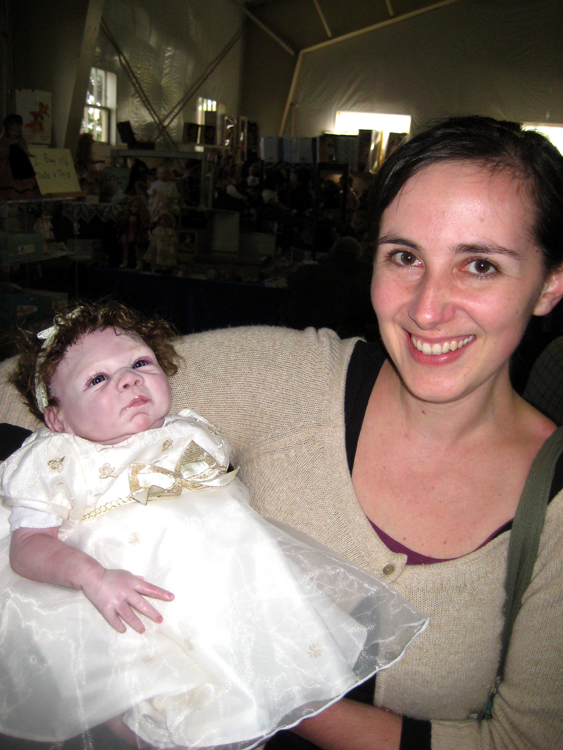 this whole "reborn" baby thing is super scary weird. did you know you can have dolls like this made to look like your own baby? isn't that kind of like the people that have their pets stuffed have have them sitting near the fireplace? what has this world come to? You know, I don't think the creepiness fades with looking at that other picture, I think it's intensified! I'm still a little creeped out.